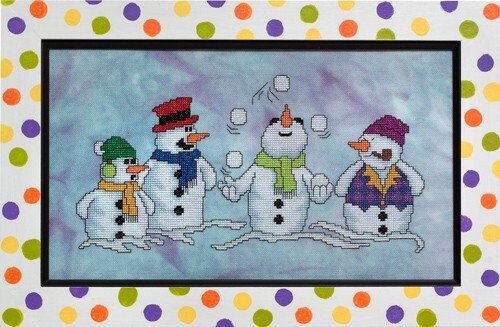 Four plump snowmen relish in a brisk wintry day. One juggles snowballs, while the other three look on in awe and enjoyment. Just an all-around-feel-good winter scene! Fabric: Stitched on 28ct “Jazz” Linen hand-dyed by Picture This Plus. Design Area: 11-3/8″w X 5-5/8″h. Suggest purchasing a fat eighth for this design (18″w X 13″h). Fibers: Uses a total of 12 colors of Rainbow Gallery Petite Silk Lame’ Braid and 4 colors of Sullivans/DMC/or Anchor floss. Comparable colors for Sullivans/DMC/ and Anchor floss are provided in the color chart (in lieu of using Rainbow Gallery). Comparable colors are “best match” and may not represent the Rainbow Gallery colors precisely, and of course, will not have the glittery effect. *NOTE: If you choose to substitute Sullivans/DMC/or Anchor floss for the Rainbow Gallery Petite Silk Lame’ Braid, then you will use white for two different symbols.